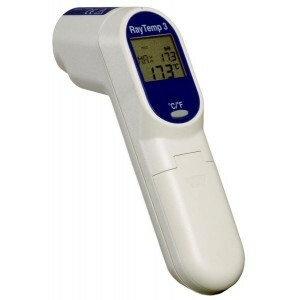 The compact and easy to use Infrared Thermometer RayTemp™ 3 (Food Safe) is a contactless thermometer designed for the food and catering industry. This infrared contactless thermometer preserves a high level of hygiene that is required in the food industry. To use the Infrared Thermometer RayTemp™ 3 (Food Safe), aim at the desired food you wish to measure the temperature of and press the button. To narrow the target area you’re measuring simply move towards the object, to expand the target area move away from object.